Guildford, UK, April 2018. For Immediate Release: Fresh from their Early Access launch success, Indie development studio Fireblade Software have released their first major update for Abandon Ship, available now on Steam. Events will no longer kill crew, but make them “Badly Hurt” instead. This means they’re unconscious and cannot be used in battle until you can get back to a port and revive them in the new Apothecary. Note – clicking on any image in this page will allow you to save it for press purposes. If a crew member is Badly Hurt, or Incapacitated in Combat, they will also gain a negative physical trait. Traits can be positive or negative, mental or physical. They provide a bonus or penalty to actions in Combat that can impact your tactics. 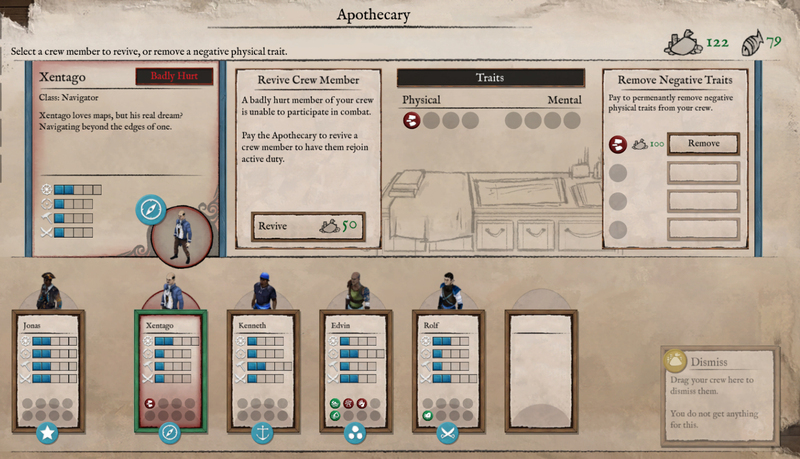 Negative physical traits can be cured in an Apothecary. These systems combine to remove the feeling of unfairness from some events, and put crew recovery firmly back in the player’s control. 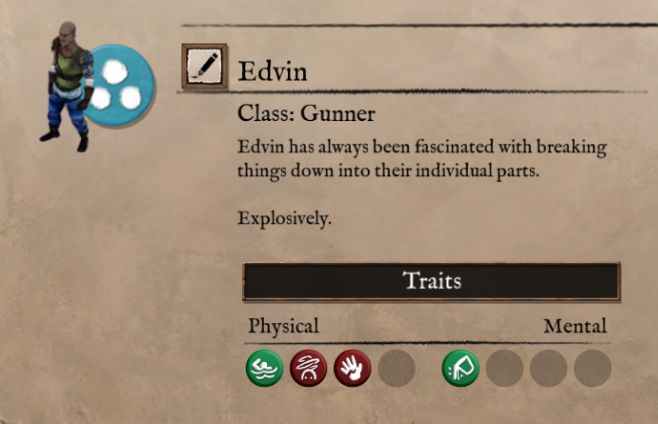 The traits, as well as providing a subtle but meaningful combat effect also give extra personality to your loyal crew. There is a new upgrade available in Port: The Diving Bell. These allow you to explore shipwrecks that are scattered around the world. Watch out for the special Golden Shipwrecks. These are very rare and contain ‘Captain’s Logs’. A Captain’s Log can be taken to the new Magistrate screen in Ports, where you can manually save your game. Abandon Ship employs an autosave system that continually saves your progress. This, combined with Permadeath and the length of the main story mode could mean players lost a frustrating amount of progress. Now, the player can explore and find these Captain’s Logs which are scarce and finite. Upon death, you can resume from your last Magistrate Save. It was too easy to become trapped in a negative downward spiral if you survived beyond ship destruction, so in these instances, you’ll want to stop off at one of the new Prisons. By paying the minimal fine, you can release the inmates into your care. These are the lowest level crew that contain a few negative mental traits which cannot be cured, one of which stops them from ever gaining experience. 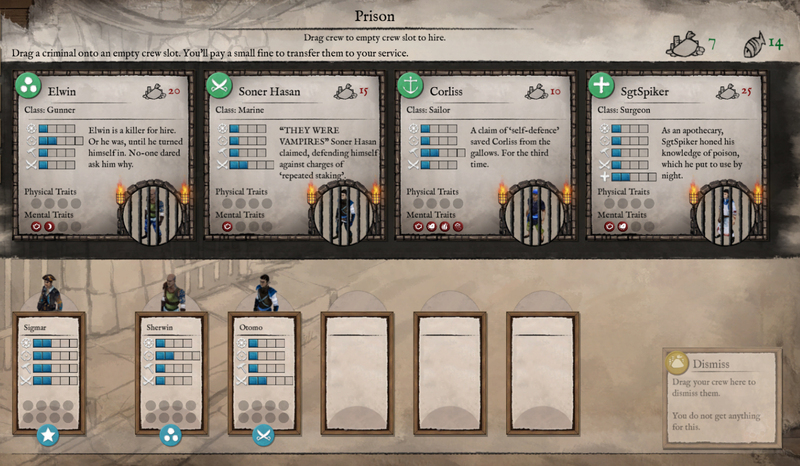 Prisoners are useful to get you out of trouble, but not a good long-term solution. You can also gain Gold in a low-risk fashion by handing over your charts of the local area to the Magistrate. A new quick-start mode allows players to dive straight into the action, and there are several changes to the difficulty modes that should improve the level of toughness for players of all levels. The Cruiser and Corvette, along with their Cult variants. Abandon Ship is available now on Steam for Early Access for $19.99/£14.99.